Apple Pools provides a range of services to professionally rejuvenate older pools that may be outdated or in a state of disrepair. Our services include everything from minor repairs through to complete transformations of pools and entertaining areas. Whether you need pool tiling, pool painting, pool plumbing, supply and installation of pool equipment or solar equipment supply and installation, we can help you with everything you need to transform your pool. Thinking about renovating, resurfacing or painting your pool? Apple Pools is the team to turn to! Apple Pools is one of the leading service providers when it comes to pool renovations throughout Melbourne. We are always on the lookout for new and exciting products, such as our recent purchase of specialised equipment for the application of EcoFinish. For further information click here. If you need to renovate your pool at your home in Balwyn, Box Hill, Brighton, Canterbury, Camberwell, Glen Iris, Mont Albert, Hawthorn, Kew, Toorak, Templestowe or Surrey Hills, Apple Pools can assist. We specialise in transforming tired old pools into modern new designs perfect for the Aussie lifestyle. No matter how old your pool is, Apple Pools can make it look brand new with our state-of-the-art pool renovations, restorations and resurfacing surfaces. Whether you want to renovate a small area or get the entire pool renovation package, we are here to cater to your requirements. Our team is highly skilled to provide you with the best pool resurfacing, pool tiling and pool-painting services across domestic or commercial sites, making your pool stand out! Apple Pools are the leaders when it comes to pool renovation services in the Eastern suburbs, including Balwyn, Box Hill, Brighton, Canterbury, Camberwell, Glen Iris, Mont Albert, Hawthorn, Kew, Toorak, Templestowe and Surrey Hills. Our experts are always available for consultation about everything you need to know about your pool, whether it is prior to your renovation or at any time throughout it. A makeover by Apple Pools will leave your pool looking stunning, adding value to your home and allowing you to enjoy the outdoors better. If you can dream it, we can make it happen! There’s no need to go anywhere else for pool renovations and resurfacing than Apple Pools. We have more than 30 years’ experience in servicing, repairing and renovating pools across Melbourne. This is why for pool renovations in Burwood, Doncaster, Forest Hill, Glen Waverley, Mount Waverley, Ringwood, Warrandyte and Blackburn south, you can be confident that your pool is in good hands. Our renovations can include a range of services, such as tiling, painting and the latest product from the States “EcoFinish” to give your swimming pool a ‘like new’ look and feel to it, which will help you enjoy it more often throughout the year and increase the value of your property. 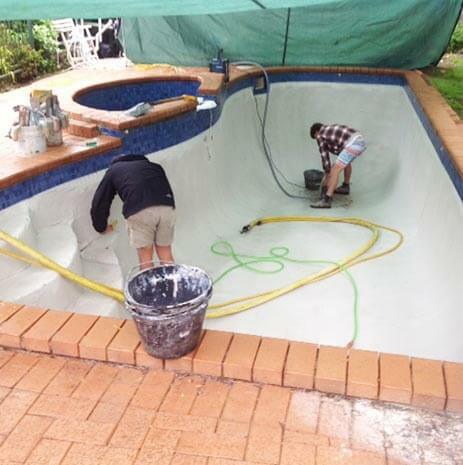 Pool resurfacing in Blackburn, Burwood, Croydon, Doncaster, Donvale, Forest Hill, Glen Waverley, Mount Waverley, Ringwood, Warrandyte, Wheelers Hill, Wonga Park, Hawthorn, Box Hill, Camberwell and Brighton is the best way to enjoy your swimming pool without having to start from scratch, making it a more cost-effective solution that takes less time and delivers fantastic results. At Apple Pools, we work with you to find out what it is you want from your pool area and make it happen. Get in touch with a member of our friendly team at Apple Pools today to find out more about how we can help with pool renovations and resurfacing in your area or call us on 03 9890 0778. Looking for a hassle-free surface that looks great? EcoFinish, a maintenance-free pool coating, is the latest technology from America, setting itself apart as the most exciting addition to pool surfaces since Marblesheen was introduced in the 1970’s. EcoFinish uses polymeric compounds that last up to 100 years, with the manufacturer providing a 10-year pro rata warranty and Apple Pools providing a 2-year warranty on our workmanship. With warranties like these, you can be sure you are making a worthwhile investment. With EcoFinish (often called the Teflon of pool surfaces), staining, fading and pool degradation are a thing of the past. EcoFinish also doesn’t affect water chemistry, being PH neutral. This means that waterline tiles don’t need to be applied and algae issues need not be a problem any longer. EcoFinish also provides a waterproof membrane to protect the pool shell, helping to keep the heat in your pool. For further information click here. If you are having trouble with deciding what sort of renovation you need, our designers will guide you through our diverse range of products, such as pool tiling in Melbourne. With our wide range of options, you can ensure any renovation meets your every requirements. When your newly renovated pool is complete, you’ll be able to enjoy endless summers enjoying the outdoors. Apple Pools deliver pool tiling in Melbourne that is above and beyond what many others provide. Your desired ambience can now be achieved thanks to our diverse range of tiles, with a variety of colours, shapes and sizes available. Apple Pools will always deliver quality materials for your pool surfaces and offer innovative ideas to ensure your pool stands out and is renovated to last, and this is why we’re the only real choice for pool tiling Melbourne customers trust. Thoughtful landscaping is key to making the most of your pool and entertainment area. Our landscaping consultant can help you achieve an outdoor living area to suit your pool and lifestyle. Pool design goes beyond how the pool simply looks. You may end up with a modern-looking pool, but be let down by its improper placement in your backyard or other landscaping errors. Our landscaping consultant can help you make the most of your investment, assisting you in achieving a pool area you always dreamt of having. Contact us today and take the first step towards having a better pool, spa or outdoor entertaining area.